Some bands in the middle of the modern trends concerning the comeback of the Metal ways from the 80’s prefer to make things on their own. What I mean is: they heard and love the old classic albums, but they aren’t trying to do that another time. That’s the difference between a band that needs to rethink its own musical work and the ones who are here to stay. 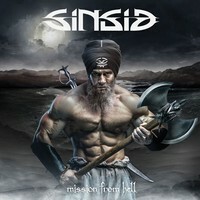 From this second group is the Norwegian quintet SINSID, because their first album, “Mission from Hell”, shows it. Of course, the sound quality of “Mission from Hell” is not focused to recreate what was done in the 80’s. No, they know that they are over, but they have the same spirit, but with a modern and clear sound quality, and what sounds aggressive is boosted, but without tearing out their melodies. It’s aggressive, melodic and clean in the due proportions. Ten very good songs wait for us all. The modern grasp of “Steel Riders”, the abrasive slow parts of the heavy ones “Hellhammer” and “Sons of the North” (this one is even more slow, showing a powerful work from bass guitar and drums), the storming melodies of “Revenge by Death”, the modern harmonies of “Mission from Hell”, and the brutal grasp of “Land of Doom” are their finest shots. Be prepared to be assaulted by SINSID!